Chicken Kadhai as the name suggest is quite heavy and oily so it should not be eaten on a regular basis.But its very tasty and its wonderful with patarhas as well as rice. Take chicken in a bowl.wash it properly with running water.Rinse all the water from the bowl.Marinate it with Curd ¼ spoon of ginger garlic pastes and ½ spoon of turmeric powder and salt. Keep it aside for half an hour. Slice all the onions. Keep a pan on stove heat half table spoon of oil in Pan now fry the onions in it till it changes its colour to golden brown.Since we are using very small amount of oil so keep stirring.Now take it off from stove and let it cool for some time and grind it into a thick paste. Now again heat remaining oil in the pan put bay leaves then cumin seeds and in the end red chillies.Add the whole garlic and then put the ginger and garlic paste in it.now add all the spices except garam masala and cook it for two minutes. Then add the chicken in it and cook it for five minutes. The chicken will leave a lot of water now put the onion paste in it and mix it well cook it for 15-16 minutes with the lid but keep stirring in between. When it starts leaving oil then add the tomatoes 1 cup of water and the garam masala powder.cook for another 1 minute and them take it off from the fire. Avoid using raw onion paste. Always cook it with lid on as it saves fuel and aroma of spices. The whole recipe is cooked on a medium flame. 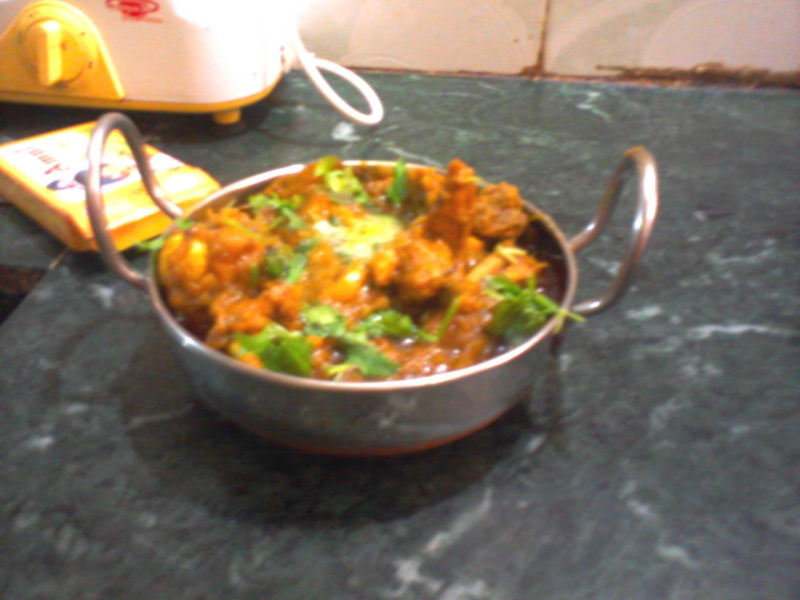 Just Loved the way to cook this Chicken Kadhai, still remember to eat this one specially i have to go to restaurant but now i can prepare this one at home. Thanks for sharing.